NIPTON, Calif. – In the high desert of eastern California, where a two-lane road and the rail tracks cross, sits a cluster of buildings that date to the turn of the last century. There is a small hotel, a 10-table restaurant, a general store. A backhoe kicked up tan dust amid the sheds and trailers where about 30 people live. Once a thriving gold-mining town, Nipton is now an experiment. The nation’s largest publicly traded marijuana company, American Green, recently bought the town for $5 million, with plans to develop a “cannabis-driven” resort on the edge of the Mojave. The investment represents the promise some see in an expanding marijuana economy once the drug, on Jan. 1, becomes legal for recreational use in the nation’s most-populous state. “This is the Hotel California,” said Stephen Shearin, a nomadic entrepreneur who manages the project here, reciting the lyrics of the Eagles song as he walked the site. The company will double the size of the five-room Hotel Nipton, and the Whistlestop Cafe is being redone. Camping will be encouraged, and Shearin said the company will add to the half-dozen tents on raised platforms already in place. The old schoolhouse will host yoga and painting classes, dancing lessons, and flora and fauna lectures. An amphitheater amid the eucalyptus will open out toward the hills for concerts and an evening bonfire will feature glass-blowing displays, creating a mix of Burning Man and Club Med far from most civilization. There is another sentiment prevalent on the eve of the law’s change: concern. A four-hour drive west along a pair of desert highways ends in Oildale, near the city of Bakersfield, in a county that glows red on maps showing the prevalence of drugs. The Kern County Board of Supervisors voted recently to forbid the sale of cannabis, underscoring the risk some communities see with the ready availability of marijuana, a drug the federal government still classifies in the same category as heroin. 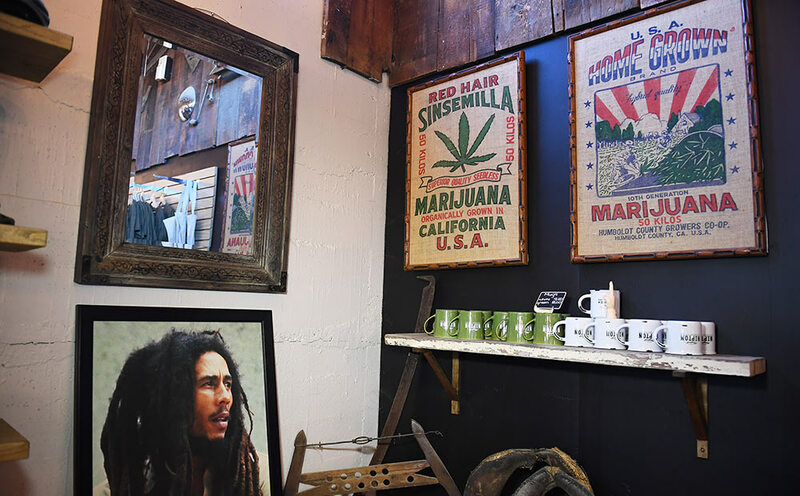 The conflicting views, shaped by geography and local history, have sharpened to a point since Californians voted last year to make marijuana, an outlawed if thriving cash crop for decades, legal for adult use and small-scale cultivation. Those with a medical prescription have been able to buy cannabis here since 1996. A referendum last year made California the eighth state, plus the District of Columbia, to make the drug legal without a doctor’s consent. While seeking to clarify California’s position, the vote has in some ways had the opposite effect on what is projected to be the state’s $5 billion-a-year legal marijuana market. The ballot measure, known as Proposition 64, allows adults to possess small amounts of cannabis and to cultivate as many as six plants. But it also allows counties and cities to regulate the sale and taxation of cannabis, and to decide on their own whether it can be grown in amounts larger than those allowed by state law for personal use. The result has been an inconsistent array of rules across the state. There is money at stake, private investment and public revenue. State and local governments could collect $1 billion a year in taxes, according to the University of California Agricultural Issues Center. Standing behind a glass case displaying jars filled with West Coast Diesel, Old Skool, Gelato and other “brands” of marijuana, Borgun said the dispensary’s patients are going to be left without a way to ease pain and anxiety. For potential investors, the federal law poses a similar problem. Without having a clear sense of the Justice Department’s position on state marijuana legalization, many businesses fear putting money into an industry that could be shut down by the current administration or future ones. Nipton is nearly surrounded by federal land, with the vast Mojave National Preserve to the south and a Bureau of Land Management tract to the north, where a huge solar-energy field shines in the middle distance. The one road into town runs through federal land, raising concerns about whether those traveling to Nipton will be subject to federal drug laws. Head southwest from Las Vegas, through red-rock canyons and into the high California desert, then take the turnoff with nothing in sight. Where the desert slopes into foothills, there is a small blur of color, which nearly a dozen miles off the interstate finally resolves itself into Nipton. Gold built Nipton, and the railroad kept it thriving for decades. Dennis Benson used to hop on the train as it slowed through town, riding it an hour west each morning to high school in Barstow. Benson is 66 years old now and has seen a series of owners buy and sell the town. Its population varied with the quantity of minerals in the hills, then with the cattle grazing in the desert – now banned by federal law – and finally with a three-barrel-a-day oil derrick, now defunct. Cannabis, in Benson’s view, is the next stage of the town’s commodity economy – the gold rush turned green. He has liked what he has seen from American Green since the new owners bought Nipton – 80 acres in all – in August. Not much new construction has happened here yet. Benson’s one-man hauling and digging company has been put to work clearing lots and disposing of junk. The town sits on the far edge of San Bernardino County, which voted in favor of Proposition 64 last year. County regulations are still being worked out, and there’s a chance that the planned resort will not sell cannabis on site. There are no plans to grow marijuana here, with water so scarce. Those are not details that concern Shearin, the irreverent 52-year-old project manager who has done a lot of business in a lot of places. He said American Green plans to invest another $5 million in developing the resort, which will be marketed as a marijuana sanctuary. The place is picturesque, a movie set, which it was for the cult 1968 biker film “The Savage Seven.” Shearin said it will continue to be pitched to Hollywood. There will be a social element, as well, a political statement on the nature of marijuana in American culture. Lindsey Davidson and her husband, Freddie Wyatt, have been hired by American Green to run the general store, restaurant and hotel. She is experienced in the field, including years in Washington, and intends to make Nipton important in ways it hasn’t been to people who live nearby, with no services for miles. There will be fresh food, and staples such as Clorox, alongside American Green merchandise, framed burlap sacks that once carried California sensimilla, hemp oils. The couple will move from outside Las Vegas to Nipton in the new year, bringing their now 6-month-old daughter, Delphine. The desert highways to Oildale run across flats nearly a mile high, past Edwards Air Force Base, before dropping down the Tehachapi range into a basin once rich in petroleum. The billboards now tell another story in Bakersfield and Oildale, where ads suggest a thriving business for bail bondsmen and lawyers specializing in arrests for driving under the influence. Hammered by methamphetamine and heroin addiction, Kern County voted against Proposition 64 last year, reflecting a broad fear that drugs, even those creeping toward legality, are crushing the community. County supervisors followed up by voting in October for a ban on all sales, a tightening of existing county law that means the two dozen or so medical marijuana dispensaries will have to close within a year. What heroin and other drugs have done to Bakersfield and Oildale are alarmingly obvious after a few hours with Sgt. Steve Wells. Wells, who has been with the sheriff’s department for 12 years, stopped one recent evening for a walk through the Manes RV Park, a 100-yard strip of patchwork trailers and tin-roof sheds. “I’ve been off heroin for a month,” the first resident who saw Wells told him, though Wells had never seen the man before. A house nearby where people were cooking “honey oil,” a cannabis concentrate, exploded last month. One man is in the hospital with severe burns. At the end of the strip sat Chris Johnson, 48, and her small family, chatting through a cool evening on seats that include a plastic bench and the front seat of a car. Later in the evening, Wells responded to a call of a man threatening suicide because his girlfriend had left him. The man’s girlfriend told Wells that she left because of her boyfriend’s methamphetamine addiction. Wells tried to calm the man down for more than an hour, only to concede that there was not much more to do. As deputies prepared to leave, a shot rang out, and the man emerged, bleeding from the head but alive.